Trouble is a part of this life. 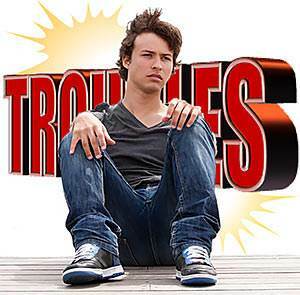 The Bible says, "Man is born unto trouble." (Job 5:7) Sometimes Christians expect God to keep them from problems and hardship, but God has not promised to do this. Christians, as well as unsaved people, experience trials, troubles, and suffering. The way in which we meet the trials of life depends on the way we inwardly see and believe things to be. If we see things from a purely human point of view, we will be discouraged and defeated. If we see things from God's point of view, recognizing His wonderful character and seeing His hand in all our circumstances, we will know peace, joy, and happiness. 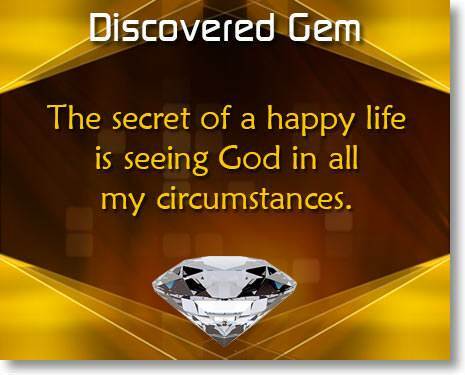 In this lesson we will learn the Christian's secret of a happy life. We must know what to expect in this life. We must know that God loves us and desires only what is best for us. We must know God's goal for us in this life. How does God conform us to the image of His Son? He does it through our circumstances and the discipline of the Holy Spirit. This involves trials, troubles, and suffering. Therefore we must expect these things since they are a necessary part of God's dealings with us to make us like Christ. We must believe that God is sovereign. The Bible says that all things are God's "servants." 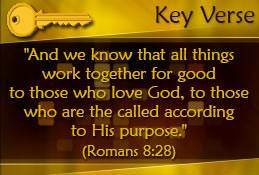 This means that all things are used by God to accomplish His purposes. We tend to think that only the good people and the good things of life serve God. But God's Word tells us that all things, whether good or bad, are God's "servants" and must therefore do His will. Even Satan and those who serve him are used by God to accomplish His will. It was Satan who plotted the death of the Lord Jesus. It was Satan who put it into the heart of Judas to betray Jesus. And it was Satan who instigated the crowds to cry out for His death. But Satan and his wicked followers were used by God as His "servants" to accomplish His perfect will for the salvation of men. We must believe that God is good. When trials and difficulties come to us, Satan tries to put his wrong thoughts into our mind. He suggests something like this, "God doesn't really love you. How could a good God let this happen to you?" L.E. Maxwell, founder of Prairie Bible Institute, said, "When we can believe that God is good in having allowed some trial to come our way, then faith can believe that God is great, and abundantly able to deliver us." There was nothing unusual about his two brothers and a sister that preceded him, but Charles Rentz was born with both arms ending in stubs and no legs below the knees. His birth came during the Christmas season. The holiday season for that Christian family turned into a time of prayer for guidance. As soon as the parents of Charles realized that their baby had a good mind, they resolved to treat him as much like the other children as possible. His family, his friends, and his teachers never allowed him to feel or act differently from any others. They accepted him on equal terms and taught him that a wise person does not question the will of God. Charles soon learned that everyone has some sort of challenge to face, not the same in having to operate with no hands or feet, but in doing the best possible job of living and serving God with whatever gifts God deems best to give him. He learned to write by placing his pen or pencil between the padded ends of his arms and moving them from his shoulders. Though he was not able to afford a college education, Charles learned all that he could. Best of all, he learned to love and trust God. Today, Charles can capably perform any physical maneuver that he needs in his daily life. He drives his own car, moves confidently up and down stairs on crutches, rolls around his office in an ordinary office chair. He can dial a telephone, type, use an adding machine, play chords on a piano. He can dress himself to the final detail except for buttoning the topmost button on his shirt. He even puts on his tie. When any machine breaks down in his home or office, he can generally make the needed repairs himself. All of this is quite remarkable when we remember that he has no hands and no feet. Charles has worked as a service station employee, an automobile salesman, an insurance agent, and as capable clerk of the circuit court in his county. He has a lovely home and a devoted family. His wife says, "The most rewarding part of my life has been living with Charles." How did this man become a "classic in courage"? 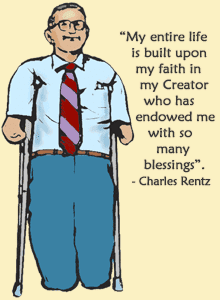 Charles himself tells the secret: "My entire life is built upon my faith in my Creator who has endowed me with so many blessings." We must believe that God's will is perfect. 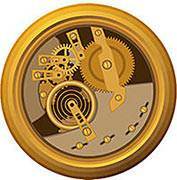 The story is told of a man who made a clock and showed it to a friend of his who had never before seen one. The fashioner of the clock opened the back of it and asked the man what he thought of its maker. The man saw some wheels, and other smaller ones, some going one way and others another way, some wheels slow and other wheels fast. Seeing this seeming confusion, he answered, "I think the man who made that is mad." Then the maker took his friend to the front side of the clock and asked what he now thought of its maker. 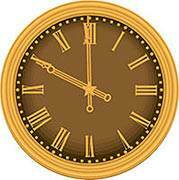 The man looked at the two hands of the clock moving smoothly and regularly, each one in its appointed circle, and both of them telling perfectly the time of day, and replied, "I think the man who made that is the wisest person who ever lived." Story quoted by L.E. Maxwell in "Abandoned to Christ," page 80; Copyright Eerdman's Publishing Company; Used by permission. This story helps us to understand a great truth concerning life. We are here on earth, and we see only the "earthly side" of God's doings, and thus we fail to see His perfect design and plan. The "wheels" are going every which way, and they sometimes seem to have no purpose or design. 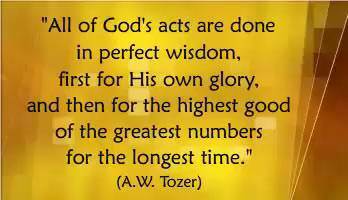 But one day we will see the "heavenly side" of God's doings. We will see His perfect design and plan for our life, and we will say, "Lord, I praise You and thank You. Your way is indeed perfect." We must surrender our will to God. There is something within us, behind our feelings and our wishes, which decides everything and controls everything. What is it? It is our will. Our will, which the Bible sometimes calls the "heart," is the stronghold of our entire being. It is not our feelings and our wishes that determine what we do. It is our will. 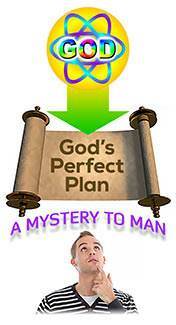 In order for God to get complete control of us, He must possess our will. 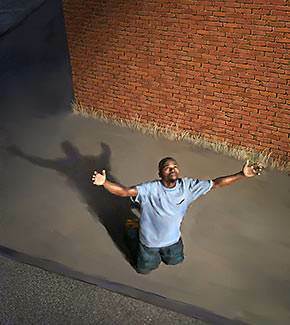 When God says, "My son, give me your heart," (Proverbs 23:26) He is asking that our will be surrendered to Him. He does not ask for our feelings or our wishes. He wants our will. Though God's will for us is indeed perfect, He does not force His will on us. 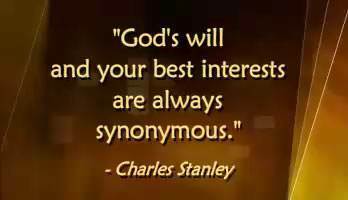 God never takes away from us our free will. If we do not surrender our will to God, then we will miss out on His perfect plan for our life. What does it mean to surrender our will to God? It means to will what God wills, in all things and at all times. This allows God to work out His perfect plan in our life. A great saint of God said, "Our wills are ours to make them Thine." We must believe that all things work together for good to those who love God. 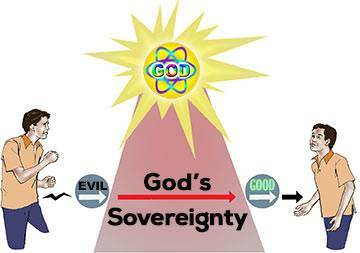 The reason why all things work together for good to those who love God is that God is sovereign. All things are His servants, and He causes them to serve His children who love Him. We may not see how all things are working together for our eternal good, but we can know it because God says so. We must receive everything from the hand of God. To the trusting child of God, everything comes from the Father's hand, no matter who may have brought it. You may say, "I can accept a thing if I know that it has come from God, but I cannot accept the things that come to me as the result of somebody's failure, or meanness, or sin. What about these things?" We know that God cannot be the author of such things as meanness or sin; but the Bible teaches that nothing can touch a child of God except God wills it or permits it. And if God wills it or permits it, He does so because He sees that it will ultimately be a blessing to His child. The Bible says that our life is "hid with Christ in God." We are surrounded by the very presence of God. Nothing can come to us or touch us except as God permits it. And, if He permits it to come to us, it is because He sees that it is for our good. It may have come from evil men and they may have intended it to be evil to us, but if God permits it to come to us, by the time it reaches us, it will be a blessing. What is the Christian's secret of a happy life? 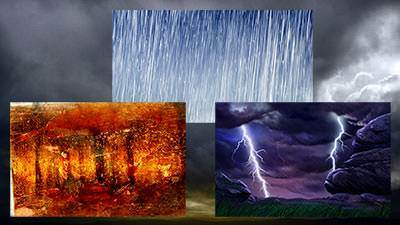 In a nutshell it is this: Seeing God in all our circumstances. Always in this life we have two choices before us. We can choose to "walk by sight" or we can choose to "walk by faith." To walk by sight means that we look at our circumstances and go by what we see. 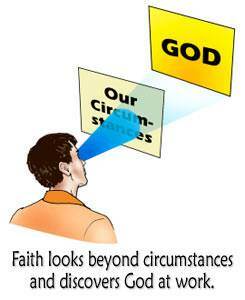 To walk by faith means that we look beyond our circumstances and see God at work behind the scenes. Let us illustrate what we mean. 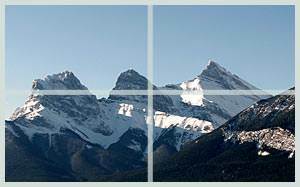 Suppose you are sitting in a house with a window which opens toward a beautiful mountain scene. There are two things you can do. You can look toward the window and let your gaze stop on the window glass itself with all its flaws and imperfections. Or you can let your gaze pass through the glass to behold the beauty of God's creation beyond. In our situation, when we choose to "walk by sight," we see only our circumstances. But, when we choose to "walk by faith," we look beyond our circumstances and discover God at work. Faith is not some kind of feeling or emotion. Faith is the choice of my will to believe what God says in His Word. 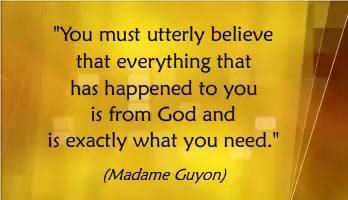 By faith you can believe that God is in every circumstance that comes to you. By faith you can believe that His will is good and perfect and the very best thing for you, regardless of how things may look. By faith you can believe that all things are His "servants." By faith you can thank Him for everything that comes to you. By faith you can say, "I KNOW that all things are working together for my eternal good." 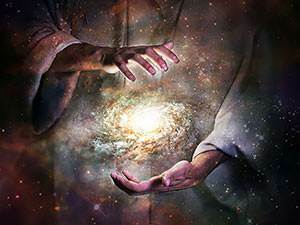 We come to realize that the whole universe is in fact in His hand. Formerly it was hard for us to believe the idea that things in the world could not move against His will, but now we know that every element in the universe—be it human or supernatural—is under His careful scrutiny and clever ordering. We acknowledge that all things come to us either through His order or by His permission. The soul that comes under the Lord's authority is a restful one. Once we busily planned; today we calmly trust the Lord. Once we had many ideas, plans and ambitions of our own; now we consider God's will best and rest ourselves in Him.